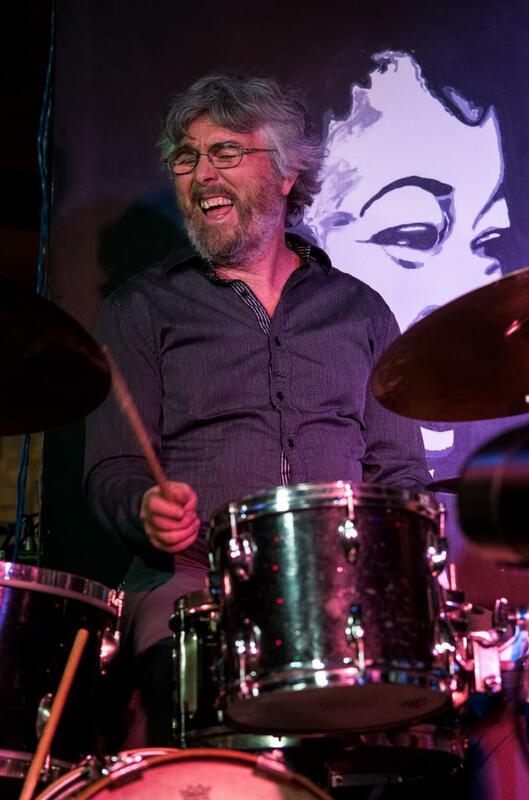 Picture taken Feb 24th 2019 by David Addison in Crofton as part of Astrid Lyre Trio date..
James McRae, Marching to The Beat of His Own Drum. 1969-71 Semi professional start. Play drums in a trio doing original and Jimi Hendrix covers and some school gigs. 1972-74 Joins prog rock band and continues to perform occasional paid gigs..
1975-76 Studies drums formally with Al Weirtz / Vancouver 1 1/2 years. Plays in a show band (Al Jolson etc) working weekends. 1977 Plays drums with Capilano College music students, Mae Moore, Scott White, and others doing periodic paid performances. 1977-1979 Plays with "Caravan", a latin jazz band including Coat Cook, Colleen Savage, Chris Nelson, Steve Nikleva, and Dido. Plays with "Dido and the Hand People", an afro influenced latin Jazz group working sporadic gigs with both these groups in Vancouver. Travels to Cortez Island with Ken Capon to do a performance with the Arntzen family. 1980 Jan. Begin as a full time working musician with 'Chico and the Clan' touring, B.C. Alberta and Yukon. 1980-81 Works with Don Hardy's 11 O'Clock Blues Band around Vancouver and B.C. interior. 1982-1983 Doing more jobbing type gigs in Vancouver with better known musicians, Hugh Fraser, Getting Off Easy, Kate Hammet Vaughen. Scholarship to Banff (1982) for the 6 week summer jazz workshop course. Theatre work 'Jesus Christ Superstar' musical North Vancouver. Educational stay in New York (1983 -5 months), taking private lessons at Drummers Collective with well known jazz drummers, Bob Moses, Michael Carvin, Frank Malabe, Elliot Zigmund. Started teaching drum lessons at a small music store in North Vancouver. Toured with Selkirk College music faculty (Peter Huse and etc) promoting their music program thru B.C. schools. 1984-85 Working with Amanda Hughes "Zone 5" with members Steve Drake, Richard Hopkins, and etc. New Years Eve gig in Edmonton with Colin James. Doing country music gigs with "Gord and Shirley" around greater Vancouver mostly at the various Royal Canadian Legions. 1986-87 Moved to Victoria, working occasionally with Pete Thompson (Tommy Banks), Rob Cheramy, Ross Taggart, Ken Hall, Tobin Stokes, Gord Clements and etc. 1988-89 Self produced and released recording with Paul Plimley, and Clyde Reed. Performance with Paul Plimley and Paul Blaney at Douglas College Theatre. Periodic music gigs in Victoria with Casey Ryder (Dennis) Marc Atkinson, Joe Huron Pete Thompson, Rob Cheramy, etc. 1990-1991 Re-connect with Scott White in Victoria and become part of "Loose Gypsies" which includes Dan Lapp, Marc Atkinson, Scott White. 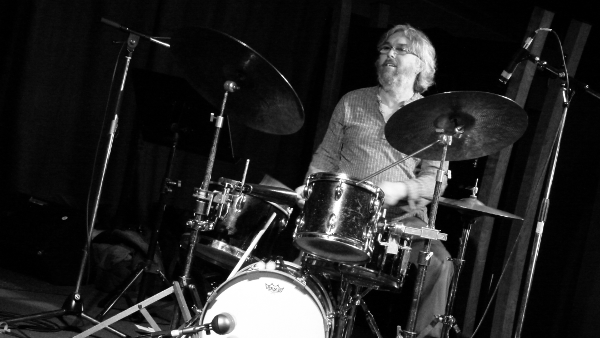 Tour Nationally on the Canadian Jazz Festival circuit. Regular house gig starting in 1991 at Pagliacci's. 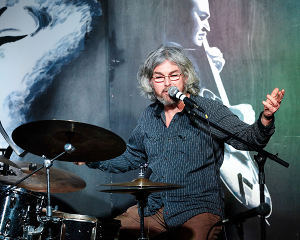 Many gigs at Hermanns Jazz Club in Victoria with members of the local jazz community. Theatre production of "Cabarat" at the MacPherson Playhouse. 1992-1995 Begin "Loose"(with Marc Atkinson and Scott White) which runs approx 4 years. Tour Nationally, make recordings, and also play jazz gigs locally under the pseudonym "Joose". Work with Nick McGowan, Floyd Standifer (Quincy Jones), Roy Reynolds, Ed Phelps, Al Peace, Henry Boudin and Jeff Williams. 1996 Victoria Jazzfest with Miles Black Trio, which included Sean Drabitt. Special guest Elis Marsalis sitting in for a few tunes. Worked for 1 year (1996-1997) with "Kumbia" and released a CD with them 1997. 1996-1999 Begin studying piano and jazz harmony, writing more and performing less actively. Doing self promoted gigs mostly at Hermanns (Victoria) with Miles Black, Ron Samworth, Kate Hammet Vaughan, Hugh Fraser, Cam Ryga, Ken Lister, Pat Coleman, John Gross (Oliver Nelson). 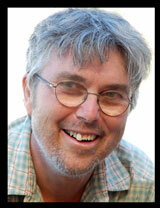 Meet and play with Brodie West (Nanaimo) Tania Gill (Victoria) and other like minded musicians. 2000 Tour of interior with leader Barbara Blair and with Rene Worst, Tom Vickery and Larry Miller. 2002 Work with Karel Roessingh, Joey Smith, Sean Drabbit, Sara Marreiros, and etc while transitioning to living in Nanaimo. 2004 Reconnect musically with George McFetridge and do performances on Vancouver Island, with Sean Drabitt and later Larry Miller (baritone sax). Steady weekly gig working with DG Allgood doing a fusion of drums and discs. 2005-2006 Recording 2 CDs with George McFetridge with group Iconoclast Trio. Tour to Calgary and interior of B.C. Nov. 2005. Play Victoria Jazz Fest with group adding Scott White 2006. Yearly gigs with Scott White and Miles Black thru into 2014 area. Began working with Gerry Barnum. Started working jobbing gigs with Nico Rhodes and Marisha Devoin. Jazz project/gigs with Monik Nordine and Phil Albert "Departure". 2007 "The Legendary Platters" BC interior tour. 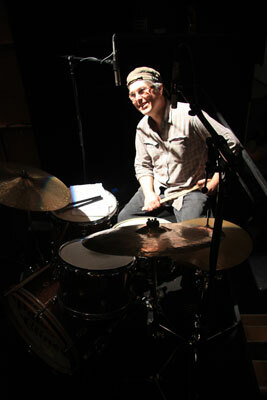 Working at the 'Blues Underground' developing young musicians..
2008 Performed with Phil Dwyer and Scott White. Started "The Message"- Horace Silver Tribute, 8 piece group where I was responsible for arrangements leading the project. Members included Darcy Philips (Jann Arden). 2009 Victoria Jazz Fest, VIEX and Dancing Man Festival gigs with "Horace Silver Tribute".Reunion gig with Loose Gypsies. Start of "The Big Bossa"- Carlos Jobim tribute project - 8 piece group doing the music of Jobim. Western Edge Theatre run of "Hedwig and the Angry Inch". Aaron Cadwaladr tour BC interior and Vancouver- October. Performances with Miles Black, Ken Lister, Roy Styfe. 2010 Chemainus Theatre Production "A Closer Walk with Patsy Cline". Rosie Bitts burlesque shows. Jobim tribute for the Georgia Straight Jazz Society, VIEX, Hermanns Jazz Club etc. Arts Club Theatre Production "A Closer Walk with Patsy Cline" Vancouver and BC Interior tour. Promoting jazz gigs for others in Nanaimo 2010-12 area. Some of the performers for these shows have included Peripharal Vision,KOGGING , John Lee, Ben Dwyer, Phil Dwyer, Jon Challoner, the Jensen's, Jennifer Scott and Rene Worst, Nico Rhodes, and Tony Wilson. Produce CD "Slow Down" with my orignal compositions, with Miles Black, Jennifer Scott and Rene Worst. 2011 Trio gigs with Nico Rhodes. Chemainus Theatre Production of "A Closer Walk with Patsy Cline" Jan/Feb. Funk gigs with "The Mo" under Marisha Devoins leadership. Tony Wilson Trio gig on Hornby Island. Arts Club Theatre Summer performance of "A Closer Walk with Patsy Cline June-August. Vancouver Island Performances of Claude Bolling "Suite for Piano Jazz Trio with Cello" with Helena Jung- cello, John Hyde -bass, Sean Mooney - piano. "Tonight Piaf" performance with Joelle Rabu group. 2012 Work with "Panache" 5 women singer ensemble. Work with "The Martys with Joan Wallace". Vancouver Island tour with Jennifer Scott, Rene Worst, Monik Nordine. First gigs with Connor Stewart. gigs with Miles Black Octet doing the music of Count Basie. Group includes Maureen Washington, Ross Taggart, Chris Davis, Mike Allen, Ken Lister, Larry Miller, Rod Murray. Gigs with David Vest 2012-15. Nico Rhodes Trio work. Jimmy Smith Tribute Vancouver Island gigs 2012-14..2012 Blue Bridge Theatre Oct 30- Nov 10th performance of "A Closer Walk with Patsy Cline." 2013 Work with "Navica" funk-rock-jazz trio includes Larry Miller, Marty Steele, including Victoria Jazzfest. Black//Lister/McRae gigs. Miles Black Octet Tribute to Ellington and Basie gigs, same lineup except Roy Styfe instead of Ross Taggart. "Five Note" neo-soul gigs with Cam Wigmore, Sydney Needham, etc. Gig with Brodie West in Nanaimo with Nico Rhodes, Marisha Devoin, Connor Stewart. 2014 Burton/McRae /Rhodes gigs. "Boss Tenors" tour under leadership of Connor Stewart. Jennifer Scott-Rene Worst Trio Island Tour dates. "Impressions of Lightfoot" Island Tour gigs in December with Marisha Devoin and Patrick Courtin. Andrew Homzys "NOLA Nighthawks" gigs 2014-15. 2016 Nico Rhodes Trio work. Black/Lister/McRae trio work. B3 Reunion work. Diana Braithwaite and Chris Whiteley Coastal BC Tour. Blues community gigs with Gerry Barnum, Kelly Fawcett, Whitey Somers etc. Connor Stewart Vanc Island tour gigs, with John Hyde, Migelito Valdez, John Lee. Work with local Jazz Composers Jesse Marshall, Lucas Smart, Astrid Lyre, Andrew Homzy, Clint Thomson and etc. bio data updated to September 2016.